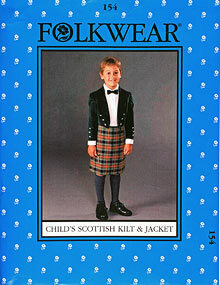 Scottish Highlanders have been wearing garments of tartan-patterned fabric (plaid) for centuries. This ancient tradition is cherished among Scottish descendants all over the world, and is still passed on to new generations so the old ways will not be forgotten. 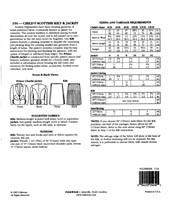 This Kilt pattern features a pleating template to simplify the measuring and pleating steps for creating smaller-size garments from a length of tartan. The pattern includes complete step-by-step instructions for pleating and finishing the garment, with the option of fringed or self-faced front edges. The Prince Charlie Jacket is constructed from specific pattern pieces and features authentic garment details for a formal outfit. Also included is information about wearing the kilt today and resources for finding tartan fabric, accessories, Sottish event calendars, and more. Child's 4-14.